Do I love cheese? You feta believe it! Ya, I like cheesy puns too. 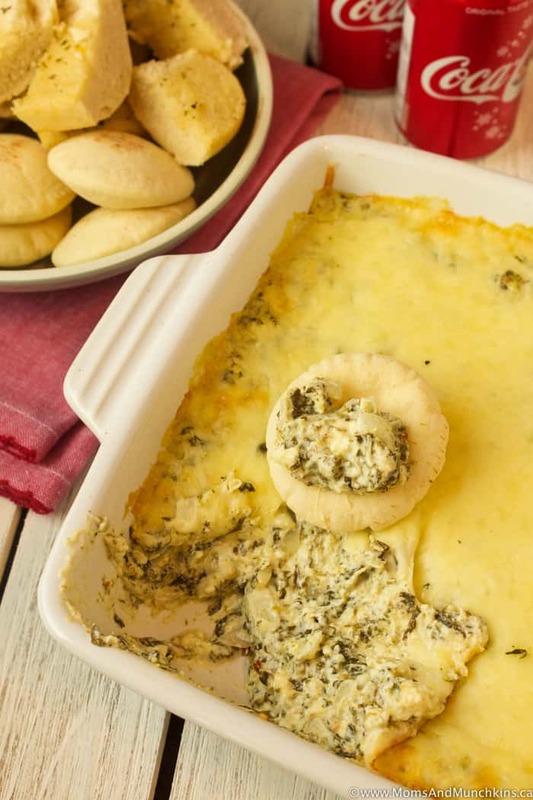 This Hot Spinach Feta Dip will be the star of your next game night! With cream cheese, mozzarella and feta, it’s sure to be a hit with all the cheese fans. It’s pretty easy to put together – just combining the ingredients all in the same frying pan then baking in the oven for about 20 minutes. Hot bubbly cheese dip…doesn’t get much better than that! I gouda tell you, this is one brie-licious dip! Okay, okay…enough of the cheesy puns. Let’s hop over to the recipe. This dip can be served with bread (like a toasted garlic baguette or pita bread) or tortilla chips. It is best served hot so you’ll want to serve this right after it comes out of the oven. It tastes good as leftovers too but it’s always best when it’s first made. This dip is best served hot with toasted garlic baguette or pita bread pieces. 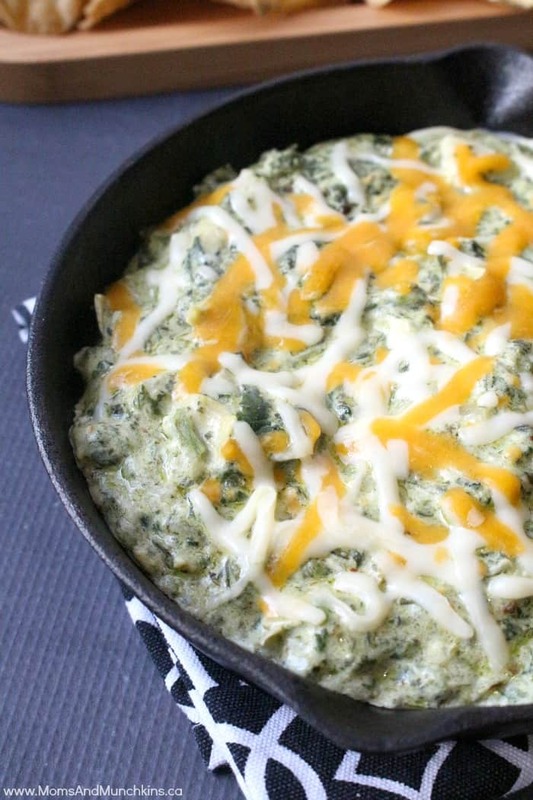 In a large frying pan, combine cream cheese, sour cream, frozen spinach, and onion. Heat over medium-high heat until heated and smooth. Stir in red pepper flakes, garlic and black pepper. Stir in 2 cups of the mozzarella and the 1 cup of feta. Stir until melted. Pour into a casserole dish and sprinkle the remaining 1 cup of mozzarella over top. Bake for 20-25 minutes until the cheese is melted. Serve hot with toasted garlic baguette or pita bread pieces. 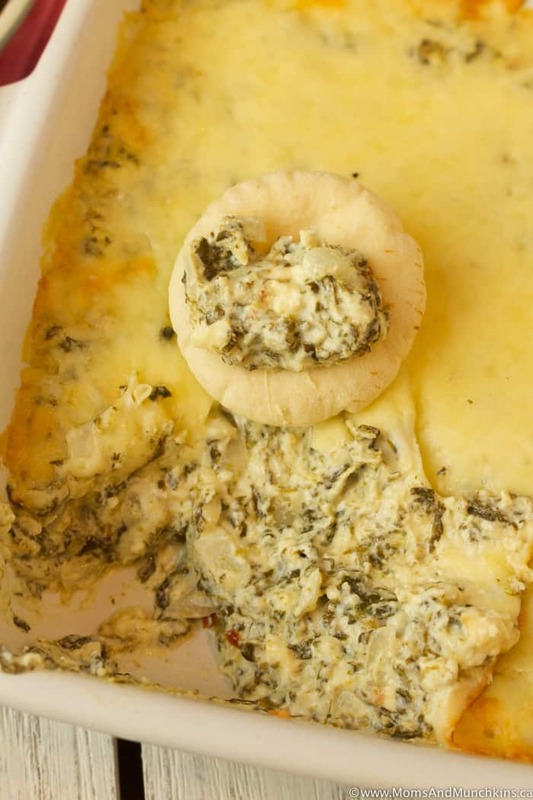 Hot Artichoke and Spinach Dip – better than any restaurant version I’ve tried! 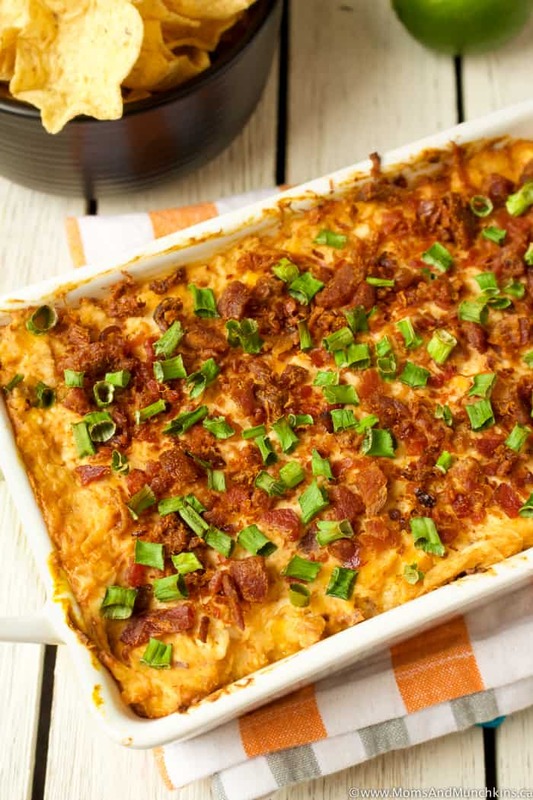 Hot Chicken Bacon Dip – you’ll be drooling when you smell this cooking in the oven! You’ll find more delicious ideas on our Recipes page. Stay updated on the latest home entertaining ideas by following us on Facebook, Twitter, Instagram and Pinterest.